Futherst north, on the border with Norway, lies Sweden’s only marina national park,Kosterhavet, which releases itself from oteher archipelagos and forms the country’s western most inhabitet group of islands. An archipelago environment that is so full of life, it is the country’s richest region in species, both above and below teh water’s surface. Here, you can spend many fantastic days in a kayak. 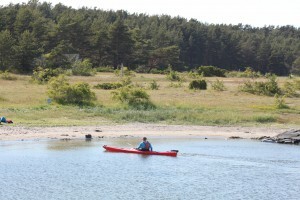 If the weather is nice and the ocean is still you can start paddling from our kayakcenter in Grönemad, Grebbestad. Just north of our center you will pass the nature reserve Tjurpannan (bulls forehead), one of the coast’s mostweather exposed routes, where teh waves can be big and diffucult. Ensure that you paddle this passage in relation to your own comfort level. If the wind is strong and you dont feel comfortable we can transport the kayaks togheter with your selves and the equipment to Havsstensund just north of Tjurpannan where the paddling will be calm and beutiful up to island of Resö, where you will find a nice accomodation at Resö Old School. There are many spots to pitch a tent, Ulsholmen, Långaskär to name a few, but remember that the area comprises numerous nature reserves where campning is prohibited so check your map before you put up your tent. Continue north and paddle west of Råssö Island, in expansive, occassionally open paddling with the Koster Fjort to your left. If you kayak all the way up to the island of Saltö, teh shortest route across the fjor is past the islands of Brattskär, which hedes a wonderful little bay on its west side, perfect for a lunch or an overnight. Paddle onwards north pass the eastern beaches of Kilesand on the South Koster Island. 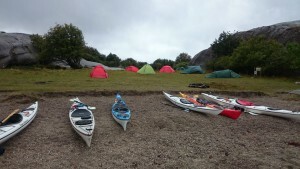 If you would like to start your trip from here we also have a kayakrental located on both Kilesand and Ekenäs, Sydkoster. Kilesand offers nice long beaches and Ekenäs is the center of the national park with Naturum visitor center that offers walks, beach excursions, snorkling, National park paddling and much more. The rangers are happy to inform you about what you can and cannot do during your kayaking trip in the nature reserve. You can find good accomodation and food at both Koster gården and Hotel Koster. Just north of Ekeäs, you enter teh strait between South and North Koster. Let your journey be slow and treat yourself to a shelfish festival at restarrant Strandkanten on North Koster or Sundets Skaldjurscafé on the other side of the strait. A slightly longer stopower will allow you to walk into Sount Koster and a visit to Kosters Trädgårdar, where you will be served an ecological lunch or supper and perhaps some live music. If you’re in the mood for a slightly longer tour, you can also paddle around North Koster. Remember that the kayaking is open and wind exposed on the island’s west side, so ensure that the weather is right before deciding. 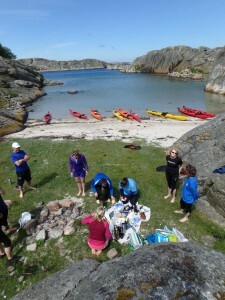 Reservatets Camping is located on the east side of North Koster, to set up your tent or hire an eco-cottage. It is the only place on both main islands where you can tent. Jutholmen, Bockholmen and Rundholmen are just a few of the very nice island to enjoy from cockpit. If the wind picks up you have good chances to find shelter behind one of the many islands. There are several nice beaches, Burholmen to name one, along the way once you have drifted around enough and feel like it’s time to get out of the cockpit. Let the lighthouses on Ursholmen be your guide for your continued journey southwest, go ashore at Yttre Ursholmen and explore Sweden’s westernmost lighthouse. Take a walk over the black penetrations of diabase into the mountain that form peculiar paths on the island floor of gneiss. Here, geologial history has created expectional natural works of art. Be on the lookout for Bohulän’s provincial animal, the harbour seal, when changing direction and paddling northeast. 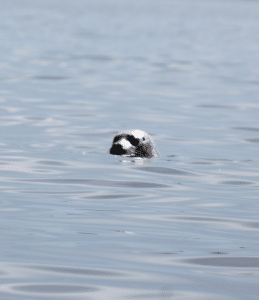 The changes of an encounter with this curious seal are great. Remeber to observe the seals at a distance, and to avoid disturbing them. The map will show the borders for the seal and bird preservation area that you have to coinsider on the way. Be careful to respect the regulations that apply. 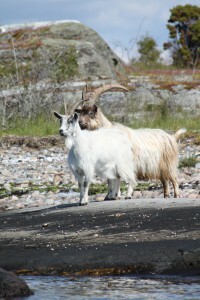 In the afternoon, aim for the narrow labyrinth of islands and inlets that welcome you around the island of Tjälleskär. Following on a map is tricky, but lots of fun to paddle. When you have found your way out of the confusion of islands, aim for Ramsholmen or maybe St Brattskär for your last night in the Koster archipelago. Steer the bow towards the island Saltö crossing the Koster Fjord on your way back to Grönemad, Grebbestad. On the way down towards Havstensund, you will have the opportunity tpo choose routes other than those on the way north. Perhaps the weater will permit a jount to the lighthouse Svangen or Ulsholmen for another overnight. When you have returned the kayaks you definetly deserve a nice meal at one of the many nice local restaurant like Telegrafen, Madvraget, Grebys to name a few.